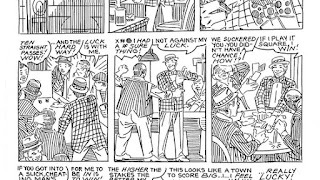 The January 2019 issue of Robin Snyder's long-running newsletter THE COMICS (Vol. 30, No. 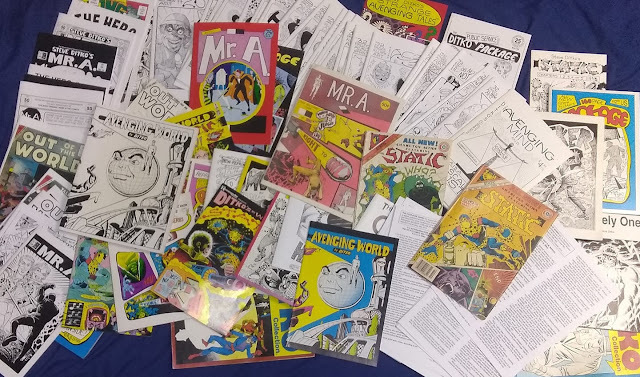 1) features several pieces on the passing of Steve Ditko, including an artistic tribute from Gary Kato, an essay by Rodney Schroeter, a long piece by Snyder in his "Under The Gun" column with several anecdotes and quotes, a few choice pieces of art from Ditko's independent work and four short essays, two of which are original to this publication ("Once Upon A Time" by Snyder and Ditko and "Sad Words" by Ditko) and two also appear in DOWN MEMORY LANE ("Identity" by Snyder and Ditko and "A Toast" by Ditko). Subscription details to THE COMICS are at the bottom of this page, along with contact information for Snyder if you want to inquire about availability of this particular issue. 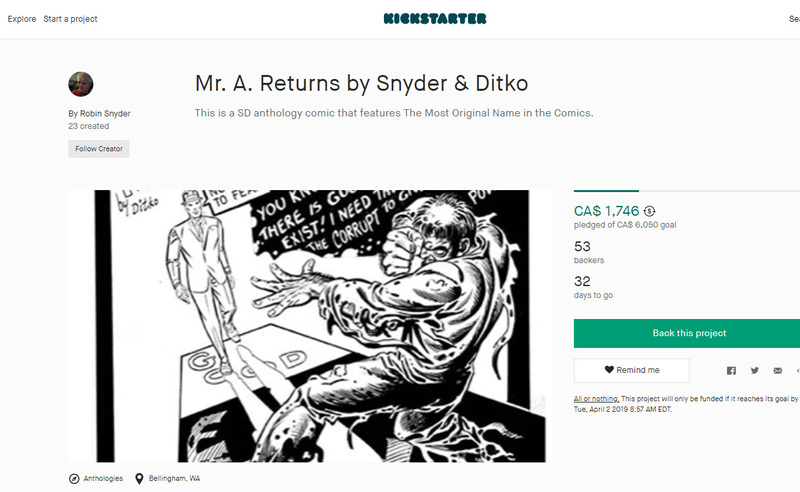 Robin Snyder has launched another Kickstarter project, this time for MR. A. 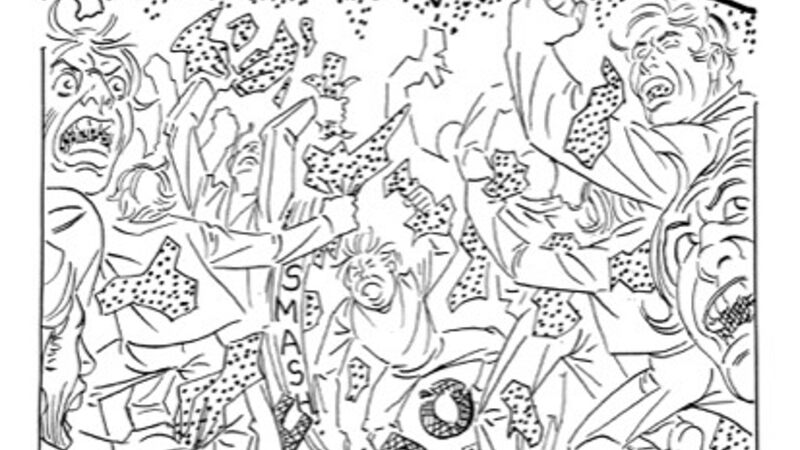 RETURNS, another 48-page anthology issue of Ditko comics, the eighth issue for the iconic title character. The featured image (probably the cover) is an especially nice example of the single-page fanzine pieces with Mr. A. that Ditko did over the years, this one from GRAPHIC ILLUSIONS #1 . Now available, DOWN MEMORY LANE, the latest release from SD Publishing. This is the 27th and final issue of The 32 Series of publications that began in 2008 with THE AVENGING MIND, and was the primary home of new Ditko comics in the 21st Century, with over 800 pages of comics and illustrations, plus essays and more. This wind up issue includes a few new pages of art and essays, plus a few reprints from earlier in the series, a letter column under Snyder's long-running "Under the Gun" title, an index to the previous 26 issues and... something else quite unexpected that I think some people will quite enjoy. I'll leave it as a surprise for those who haven't gotten the book yet, but I will say it'll take some time to absorb (it's 12 pages of the book). Available now or soon from the usual sources, including direct from Robin Snyder over here with the other Snyder/Ditko publications, now by popular demand accepting PayPal. Retailers who are interested in making the books available to their customers should contact Snyder for wholesale rates. And while it may be the end of The 32 Series, it's not the end of SD Publishing, so expect news on their next book soon. Latest SD Publishing Kickstarter is now up. DOWN MEMORY LANE is the hook, and possibly the title, and it has something to do with the THE AVENGING MIND book published 10 years ago, which kicked off the long series of "Ditko's 32s" that has run for 26 issues to date, the latest earlier this year. The featured image is from the inside cover of THE AVENGING MIND. It will no doubt, after the Kickstarter is over, also be available direct from Snyder, along with most of the previous books, details here. Now available, TALES OF THE MYSTERIOUS TRAVELER NO. 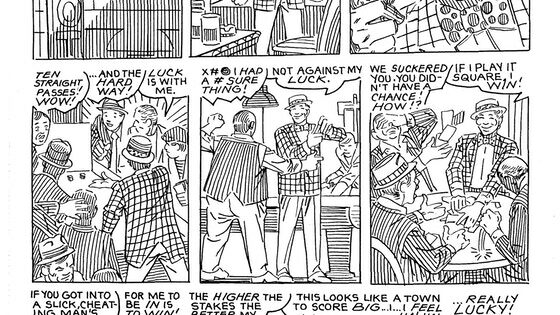 27, the latest release from Snyder and Ditko. The book leads off with the 8-page "If...Then... 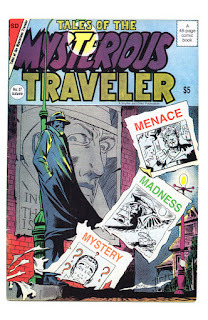 The Game", continuing a feature from the late 20th century and the first posthumous release of original material from Ditko. 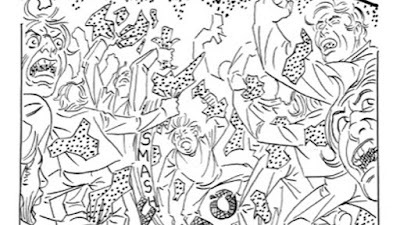 The rest of the book is a voyage through Ditko's work in the first six decades of his professional career, with samples of his Charlton work in the 1950s and 1970s and his independent work from the other decades. There should be some news on the next book within the next week. Couldn't quite get up to 91 publications there for the photo (I guess if I stretched things a bit I could), I'm hoping by next year I can get up to 92. --Link-- Ditko Kickstarter "Something Different"
Robin Snyder now has the next SD Publishing project up at Kickstarter, promising "Something Different" in the 48-page anthology which will be published later this year. And a reminder that a treasure trove of Snyder/Ditko published comics are just a quick mail order away, including most of the books from the previous Kickstarter campaigns, but more of them are going out of print. 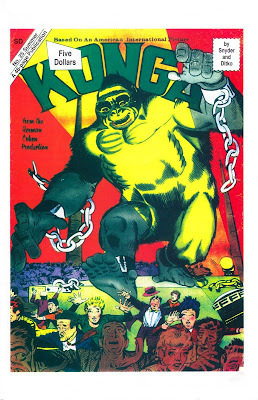 Now available from SD Publishing, the 48 page KONGA #25, picking up the numbering from Charlton's FANTASTIC GIANTS #24 in 1966, which had continued from the 23 issue run of KONGA from 1960 to 1965. 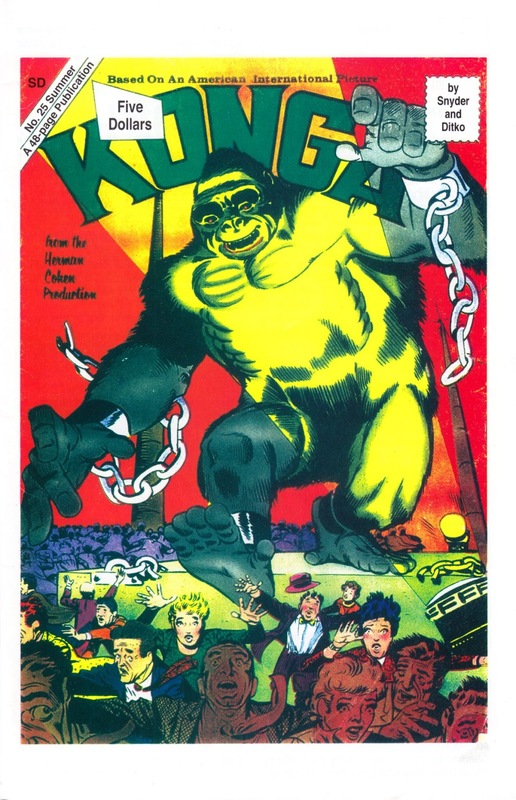 The opening story features the title character in "The Land Of The Frozen Giants" from KONGA #8  and then there are seven more Charlton published short stories dating from 1957 to 1962, all of them sharply reprinted in black and white. Available now or soon from the usual sources, including co-publisher Robin Snyder over here with the other Snyder/Ditko publications, now by popular demand accepting PayPal. Retailers who are interested in making the books available to their customers should contact Snyder for wholesale rates. Snyder informs me that a few more of their older issues have gone out of print (ACT 3 and #20), so don't hesitate if there's anything you need. On the flip side, there are new editions of some of the FOUR-PAGE SERIES issues available, #5 and #6, which are available for US$1.50 postpaid (US$2.50 international).